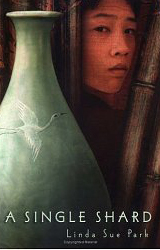 Tree-ear is an orphan boy in a 12th-century Korean potters? village. For a long time he is content living with Crane-man under a bridge barely surviving on scraps of food. All that changes when he sees master potter Min making his beautiful pottery. Tree-ear sneaks back to Min's workplace and dreams of creating his own pots someday. When he accidentally breaks a pot, he must work for the master to pay for the damage. Though the work is long and hard, Tree-ear is eager to learn. Then he is sent to the King's Court to show the master's pottery. Little does Tree-ear know that this difficult and dangerous journey will change his life forever. Intrigues, danger, and the same strong focus on doing what is right turn a simple story into a compelling read. . . . A timeless jewel.